It's been a couple of weeks. The decorations are down but not stowed in the attic in deference to the fact that we are moving very soon. Possibly as soon as the end of the month. It's exciting - hopefully by the time this posts, we'll know exactly when we are moving. It's also a bit terrifying - it feels like there is a lot to get done. I'm so much looking forward to spending the majority of 2016 in a house that will be big enough for us. Anyway - Christmas. It was a fairly quiet affair but that was what we needed really. It was just after my first term back at work after maternity leave and D and Roo have had a term of getting used to new childcare arrangements. We were all tired and it was lovely just spending time together and not really doing a lot. As always, the kids got new PJs for Christmas Eve and we started the day with pastries. D got a scalextric and a Raspberry Pi and Roo had some VTech Toot Toot stuff. 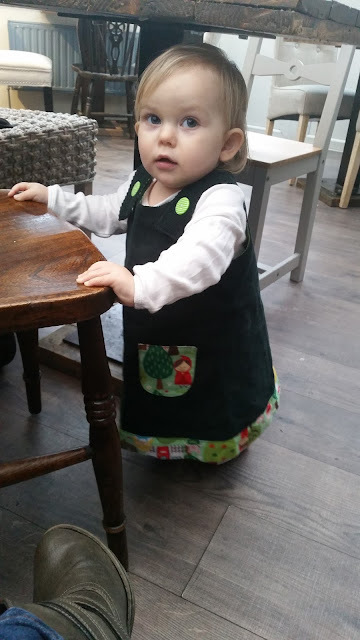 She also got this extremely cute dress from Nosy Rosie. I'm eyeing up that fairy dress next! We popped to the Fisherman's Cottage for a drink after a quick lunch at home. 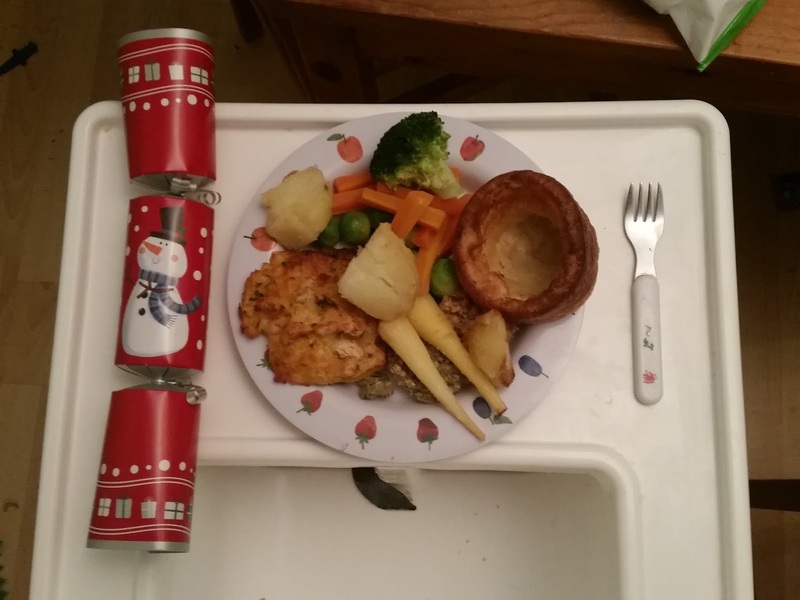 Moving Christmas dinner to the afternoon helped to make everything feel a bit more relaxed - and without a turkey, it all feels a lot less pressured anyway. I was struggling a little this year. I wanted to go with something a bit more adventurous than a Quorn roast but the other option that I normally make - a butternut squash and mascarpone pie - would be utterly rejected by D. I didn't fancy going to the hard work of making it for him to turn it down and just didn't want to face the battle. Christmas Day isn't about that. So, I spent a fair bit of time trawling some of my favourite blogs and found this really helpful round up of vegetarian Christmas recipes. Best bit? You can have gravy with them. Ultimately, I was drawn to these carrot and cannellini cutlets. They ended up looking a bit more like burgers for me. They were delicious. I followed the recipe exactly as it was but think I might do a bit of tinkering next time... but only for inventiveness. They were extremely good. She made a good stab of it, trying most things. 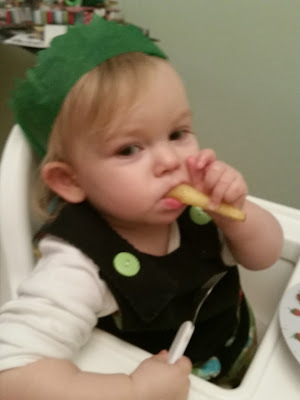 She was particularly fond of the baby roasted parsnips. Good taste, kid! 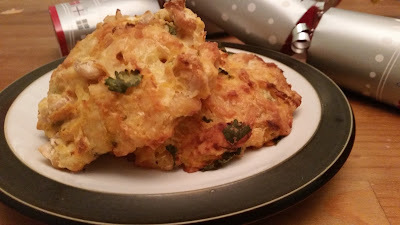 I asked some other veggie bloggers what they had on Christmas Day. Take a peek at their choices below. Choclette from Tin and Thyme made this delicious lentil and brazil nut roast. Rachel had this garlic sherry mushroom tart that I really wish I could get away with serving to my family! What did you have? Did you go for the traditional or something different? I'd love to know!